Pancakes, need I say more? In my eyes there is no breakfast better than the mighty pancake. 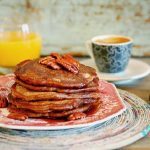 I’m always on the lookout for a new and delicious variety, these toffee nut pancakes are my number one Sunday morning treat. This is a mega indulgent and ridiculously delicious stack of pancakes. Hooked yet? They’re a bit strange as the batter doesn’t contain any sugar, instead gaining that super sweet taste from the pulverized toffee pieces. If you’re not much of a morning person you could always make the batter the night before and rest it in the fridge, that way you can have delicious pancakes without the hassle of weighing, cracking and mixing. Place a large, none stick frying pan over a medium heat and melt 1tbsp of butter. Put the toffee and pecans in the bowl of a food processor and grind them down till the resemble large breadcrumbs. Don’t worry if you have a few larger chunks of toffee, they’ll melt into an ooey gooey treat while cooking the pancakes. In a large bowl mix all of the dry ingredients together. Whisk the milk and the egg together in a jug and add to the dry ingredients, mixing until just incorporated. Add the oil and mix to combine. If using right away rest the batter for 5 minutes, if making in advance cover the batter with clingfilm and place in the fridge till you are ready for pancakey goodness. Using a ladle scoop a small portion of batter onto your heated frying pan and cook over a medium heat for around 3 minutes per side. Look out for bubbles rising to the surface of the batter and bursting, this is usually a good indication of when to flip your pancake. Serve with a scattering of pecans and a drizzle of caramel sauce.